In 1972, Marvel handed a new magazine, Supernatural Thrillers to Roy Thomas. The new magazine, which ran 15 issues, started as an attempt to capture the new macabre movement in comics. With the loosening of the CCA rules, Marvel thought they could now adapt classic weird short stories into comics, giving the medium more legitimacy. This plan lasted four issues, adapting Sturgeon's “It”, The Invisible Man, Robert E. Howard's “Valley of the Worm” and finally Dr. Jekyll and Mr Hyde before the original creation N'Kantu, the Living Mummy came to dominate the title. In December 1972, the first issue of DC's Swamp Thing had just appeared, Gold Key had just released their first “Lurker in the Swamp” story, and Marvel's own Man-Thing had just merited its own magazine appearance as the lead in Fear, and Skywald's Heap was going strong in Psycho. That's a lot of swamp monsters to choose from. It had been three years since Roy Thomas had created the Glob. The Swamp Monster was at virtually every publisher, but no one had yet begin to really delve into the possibilities such a character held for long-term story telling. When Roy Thomas was handed the opportunity to launch a more literary series, he decided the first story he wanted to adapt was Sturgeon’s “It.” He adapted the story himself, primarily using Sturgeon’s language. As a fan of the story, why wouldn’t he? Thomas had been a professional for three years at this point. The first story he’d worked was the Incredible Hulk story in which he had created The Glob. His adaptation of Sturgeon’s story is solid, using as much as the original author’s text as he could, while still adapting the story to a different, more visual medium. The art is good. Not as moody as Wrightson, Bissette, or Mayrik, but the faces are expressive, and the emotional content of the story is conveyed well. Penciler Marie Severin would illustrate more than a hundred and sixty issues for Marvel. Especially effective is the panel Where Alton tells Corey about finding the corpse of his dog Kimbo is excellent. The tension in Alton’s stance, the sadness mixed with wariness are plain. The creature itself is painted in a combination of green and gray, and is not as distinct from the background as Swamp Thing and Man Thing would be. Which is a bit of a shame since it’s difficult to see exactly what It looks like. The coloring, however, emphasizes the fact that it is made of the swamp stuff that surrounds it. Although it is human-shaped, It does not have a recognizable face. It has eyes, but they are usually brushed over in the same color as the rest of the creature. Other swamp monsters have red eyes, which helps to separate them from the rest of the creature, but that’s not the case here. As a result, I find it difficult to figure out which direction the creature is ‘facing.’ This and the coloration leads to a certain amount of cognitive dissonance, which is not entirely unwelcome in a thriller/horror comic. The way that Alton dotes on the dog makes me wonder if the dog as adjunct was a deliberate homage on the part of Swamp Thing scribe Len Wein. 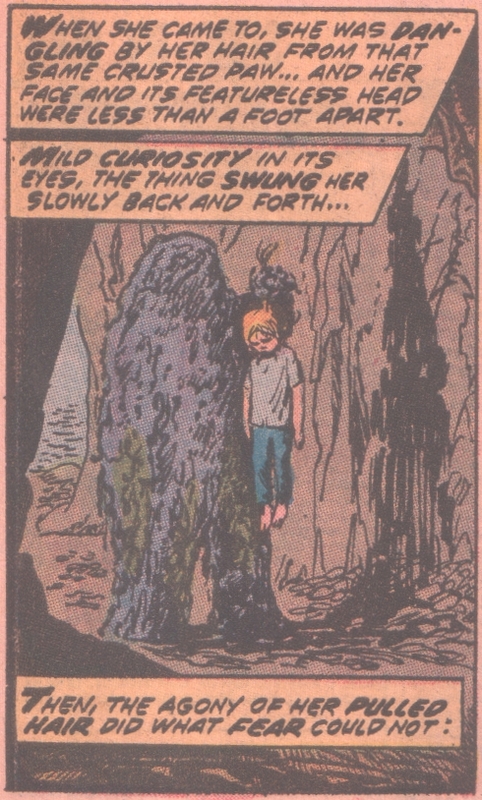 Steve Gerber also wrote a story involving a dog in the swamp, in issues 9 and 10 of Man-Thing. Kimbo is one of the early emotional hooks that moves the plot of “It” forward. Apparently, Marvel had the idea of turning “It” into an ongoing series. But what good would it have done to set one swamp monster against another from the same publisher? Man-Thing had done well enough to was doing reasonably well. Was there enough market for two Marvel swamp monsters? Thomas didn’t think so. So “It” remained a one-off from Supernatural Thrillers. Unfortunately, Marvel has lost the contract Sturgeon signed, so it was reprinted once. Beyond that, it’s in legal limbo, since no one knows the terms of the contract. So muck monster completist’s only hope of finding the story is to buy an old comic. Luckily, it’s not enormously popular, so copies are relatively inexpensive. It's a good single issue, and brings the origin of the swamp monster back to its origin, the Theodore Sturgeon story. But it's a single issue, so there's really not a lot to dig into here. Next month, Warren Publishing gets into it with their own, pretty unique swamp monster.